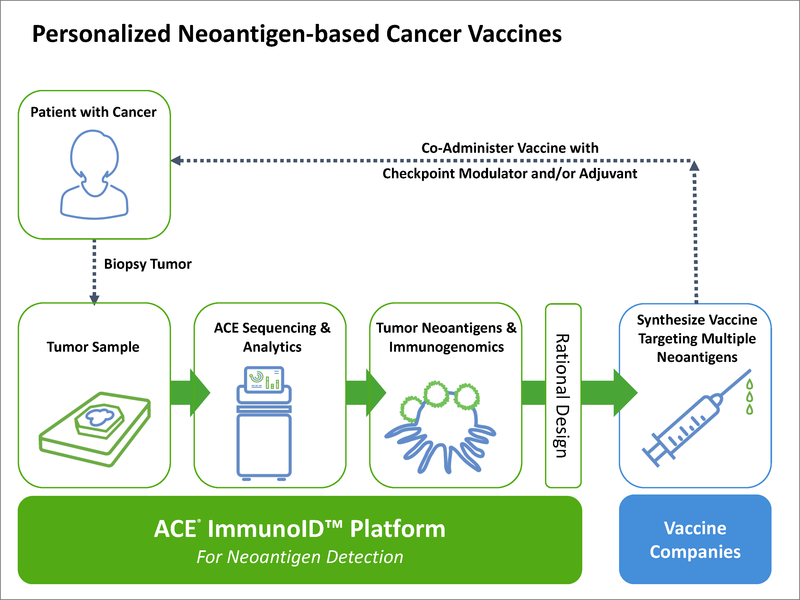 From data presented at both AACR and ASCO in the past months, amazing progress continues to be made in the development of neoantigen vaccines. As we marvel at the growth and big steps forward, let’s assess what still remains unclear or represents a significant challenge for cancer investigators working on these transformational therapies. 1. In what cancer types will these vaccines prove to be the most effective? Understanding which cancer types, and subtypes, will derive benefit from a neoantigen vaccine approach has not yet been established. The first-in-human clinical trials have focused on choices such as melanoma that have a high mutation rate (Ott et al. 2017, Sahin et al. 2017). However, as Catherine Wu from Dana-Farber Cancer Institute put forth in her 2018 AACR platform, “Can a vaccination approach be tested in lower mutation rate tumors?” Her group is actively trying to address this question using a more challenging cohort of glioblastoma multiforme (GBM) patients. With fewer neoantigen targets, can an effective immune response be generated with a vaccine? Along with selecting the appropriate cancer type, the proper schedule, dosing, delivery mechanisms and adjuvants are also further considerations (Ott et al 2018). 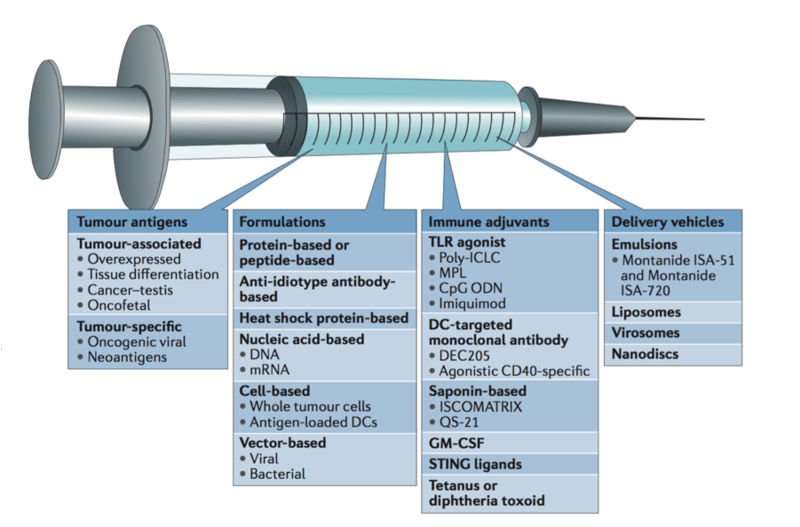 Along with cancer type, what formulations, adjuvants, and delivery vehicles will make for an effective neoantigen vaccine? 2. 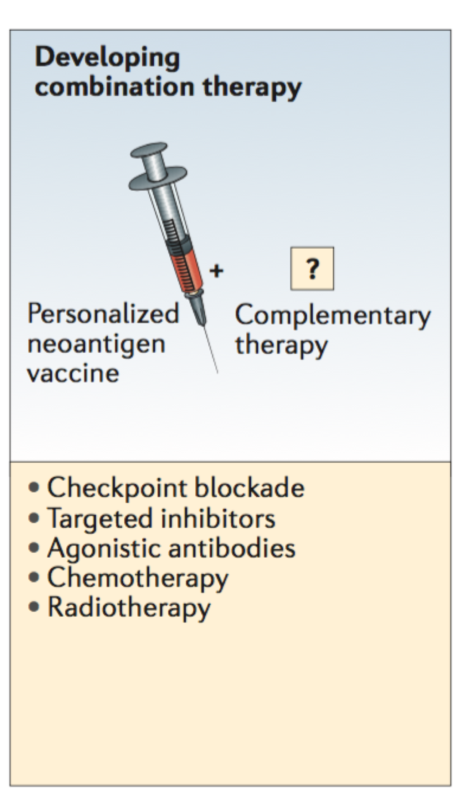 What combinatorial therapy approach should be used with personalized cancer vaccines? Combining two or more cancer treatment therapies could potentially be more effective if each agent works in a synergistic or additive manner. However, the unanswered question is which agents should be paired together. Should these vaccines be standardly paired with a checkpoint modulator, chemotherapy, or maybe even a targeted therapy? 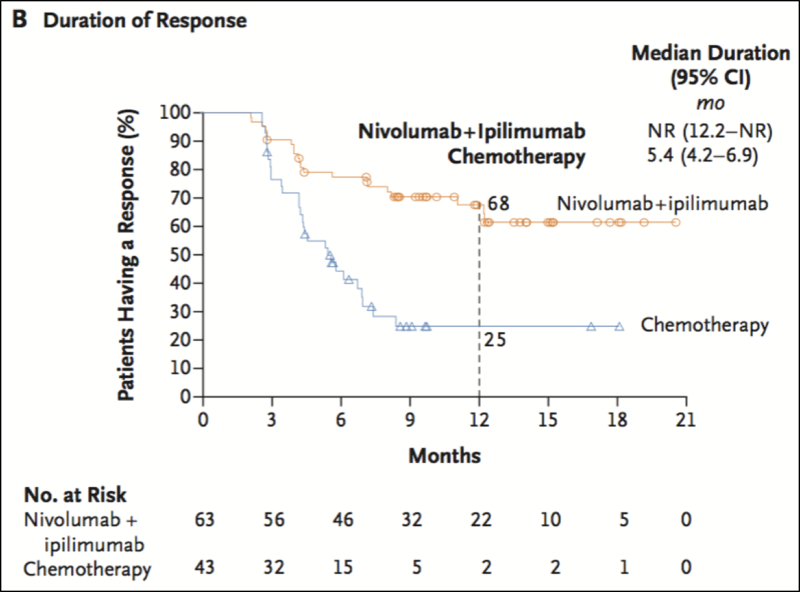 Perhaps the treatment strategy rationale should be based on the genetic profile of that particular patient’s tumor. In addition to the personalized approach of the vaccine design, further tailoring patient treatment to the tumors molecular characteristics could prove beneficial. For example, this could mean pairing the vaccine with PI3 Kinase inhibitors for tumors with PIK3CA gene mutations in Estrogen Receptor positive (ER+) breast cancer or using BRAF inhibitors in BRAF-mutated melanomas. Data from the recent TCGA (The Cancer Genome Atlas) PanCancer analysis, suggests that over 50% of tumor specimen have clinically actionable targeted therapies (Sanchez-Vega et al 2018). This investigation included 9,125 tumors from > 30 cancer types and they also found that 30% of the specimen had 2 or more targetable mutations. As with all types of immunotherapies, we look to improve upon the benefits seen in monotherapies by combining agents with complementary mechanisms of action. Planned studies and those already underway will hopefully unravel the most safe, efficacious, and practical combinations. 3. Will these therapies result in a durable clinical response or what tumor resistance mechanisms will come into play? Immunotherapy is “fighting fire with fire” as a patient’s own immune system is stimulated to attack cancer cells. For checkpoint modulators in particular, these powerful treatments have shown great potential, yet the vast majority of patients ultimately progress. However, the durability of the responses in personalized cancer vaccine treatment has yet to be defined. Both intrinsic and acquired resistance mechanisms can enable tumors to avoid elimination. The mechanisms are numerous. Tumors can reduce antigen expression by down regulation or loss of the MHC (major histocompatibility complex) (Zaretsky et al 2016, Garrido et al 2016). Induction of the IDO1 enzyme can result in many immunosuppressive reactions such as increased proliferation of Treg cells . Loss of tumor suppressors, like PTEN, can lead to tumor growth (Peng et al 2016). The Wnt-B-Catenin pathway is also suggested as a resistance mechanism by inhibiting oncolysis. By exploring which resistance mechanisms are particularly pertinent in personalized cancer vaccines, the efficacy of these treatments can be enhanced. 4. What biomarkers will accurately predict patient response to treatment? As we’ve seen for immune checkpoint modulators, assessing PD-L1 expression or microsatellite instability are the biomarkers in current clinical practice. Though not in clinical practice yet, tumor mutational burden (TMB) is defined in the field as an emerging biomarker. Recently published and presented at AACR, Checkmate 227 demonstrated that high TMB in lung cancer patients treated with Nivolumab and Ipilimumab was associated with response, regardless of PD-L1 expression (Hellmann et al 2018). Yet, standardization of TMB is still needed. This includes understanding what variant types are considered in the metrics, threshold settings, or assays are appropriate for testing. Moreover, other intriguing biomarkers are also under active investigation. These include examining the immune cell repertoire diversity, the composition of the microbiome, or utilizing gene expression profiles. It’s been proposed that likely not a single metric will accurately define a patient response to immunotherapy treatment in such a complex disease as cancer. A more multidimensional metric consisting of various factors such as those mentioned here and beyond could provide more reliable predictors. For cancer vaccine development (as well as with checkpoint blockade therapies), there are quite complicated interactions between the tumor and the various infiltrating immune cells of the microenvironment including T and B cells, natural killer cells (NK), macrophages, and dendritic cells. Deciphering exactly how these immunotherapies modify these diverse interactions commands deeper research. There should be a high priority in neoantigen vaccine clinical trials to include biomarker analysis in study designs to help make rational decisions for patient population inclusion in the future. 5. What criteria should be used in narrowing down potential neoepitope candidates from NGS data? With the advances in NGS technologies, the ability to accurately and cost-effectively (as well as quickly!) sequence both the tumor and the matched normal specimen is now possible from only ten’s of nanograms of tissue. Both fixed and fresh tissue, as well as limited materials from fine needle aspiration can be used in this process to determine the tumor specific, or somatic mutations. Although there are many obstacles to keep in mind from start-to-finish in the NGS workflow (detailed in our previous blog from February 17, 2017; Neoantigen Discovery), one that is still problematic is how to select those potential neoepitopes from a plethora of candidates to ultimately use in the vaccine design. MHC Binding affinity and RNA expression are essential criteria used. Yet, understanding immunogenicity, similarity to self, antigen processing, and protein stability are other considerations. Bioinformaticians are working hard to improve algorithms and testing data sets to better address these criteria. Further, another secondary question might also be, how many neoantigens should be used in the vaccine design process? Immunizing against multiple neoantigen targets could increase chances for a response. Questions certainly remain in personalized cancer vaccine development, as the process is undoubtedly complex. Here we’ve summarized some of the lingering uncertainties and strategies being investigated by leaders in the field. At Personalis, our focus has been addressing the challenges in the “front end”, using our enhanced ACE ImmunoID PlatformTM to provide quality NGS data of tumor/normal specimen for advanced analytics to fuel vaccine synthesis and biomarker (of treatment response) discovery. If you would like to learn more on our differentiated, high accuracy genomic solutions to take on cancer vaccine development, please visit us at www.personalis.com.